Parables are simple stories illustrating a moral or spiritual lesson. Jesus loved using parables to teach lessons. The Scriptures, primarily in the Gospels, contain many of these stories that Jesus told. During his earthly ministry, Jesus called the poor and needy to salvation. Many Gentiles fell into this group of people. The Gospel writer Luke had a keen interest in them. In contrast to the rich and affluent, the poor and needy are the largest target group of the Gospel. Parables compare two things. Jewish rabbis had used parables to hold an audience’s attention while illustrating an important moral point for centuries. Jesus uses them to teach his disciples, the religious leaders, and the crowds that gathered around him. Jesus did not start out teaching parables initially but turned to them once many rejected him as the Messiah. During his earthly ministry, Jesus performed many miracles, demonstrating to those who witnessed them that He had the power and authority that only God could have. In a way, parables are miracles in words. You might recall from the Gospel of Matthew, chapter 13, that at one point the disciples asked Jesus why he spoke to people in parables. And he responded by explaining to them that he wanted to share a new revelation about the Kingdom with the disciples—the believers—but not with the multitudes. Many had rejected Him. His message was intended for those who believed or who would believe. Therefore, Jesus chose to use parables to share these insights in a mysterious way—demonstrating that God knows what will happen in the future. Mysteries are secrets that the Lord shares with the Elect—those He has chosen—like the Disciples and those who believe in Him. Jesus was revealing some of God’s plans concerning the future of the messianic kingdom, but He was not allowing the unbelieving multitudes to understand these plans. As believers, God’s truth is revealed to us in a way that unbelievers cannot understand. Like the Apostle Paul, the scales have been removed from our eyes, freeing us from our spiritual blindness. Once we were blind, but now we can see. 1 Now the tax collectors and sinners were all drawing near to hear him. 2 And the Pharisees and the scribes grumbled, saying, This man receives sinners and eats with them. 3 So he told them this parable: 4 What man of you, having a hundred sheep, if he has lost one of them, does not leave the ninety-nine in the open country, and go after the one that is lost, until he finds it? 5 And when he has found it, he lays it on his shoulders, rejoicing. 6 And when he comes home, he calls together his friends and his neighbors, saying to them, Rejoice with me, for I have found my sheep that was lost. 7 Just so, I tell you, there will be more joy in heaven over one sinner who repents than over ninety-nine righteous persons who need no repentance. God rejoices when the lost are found. Being a shepherd was one of the most common occupations in Palestine during Biblical times. Small farmers often had a flock of 100 sheep. It was also the norm for a shepherd to count his flock at night before calling it a day. In this allegorical vignette, the herd of sheep were hiding in plain sight, grazing or resting in open country. The lost sheep in this parable was lost due to its own foolishness, not because the herd was hard to find. Knowing one of his flock had gone astray, the shepherd heads out to find his lost sheep. Upon finding his lost sheep, the shepherd is not angry or upset. He does not scold the sheep. HE REJOICES. In the same way, when we like sheep have gone astray, God rejoices when He finds us, rescuing us from harm. 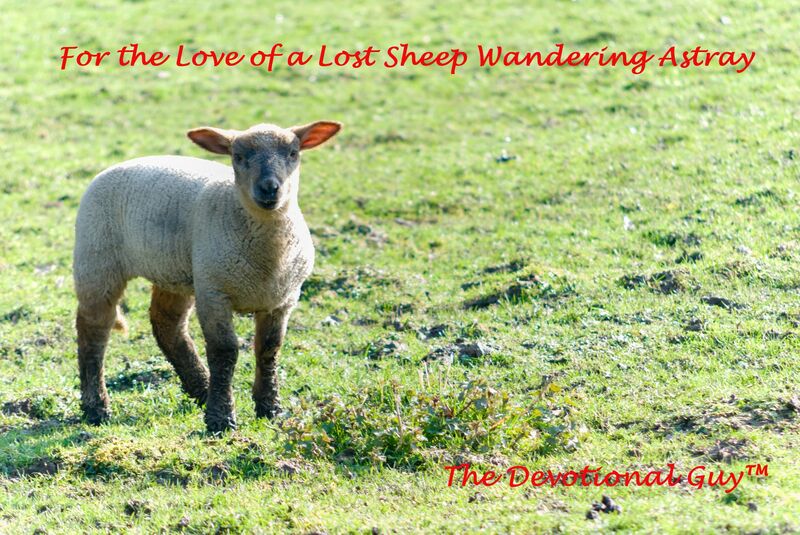 I don’t know about you, but I can relate to that foolish sheep who wandered away from the safety of the flock shepherded by God. I wrestled with sin a longtime before coming to believe in Jesus and repenting from my old ways. This doesn’t mean I don’t stumble. It certainly doesn’t imply that I am perfect in any way. No, I am still in the process of being perfected by the Lord. But, I am no longer lost. I am on the right path. The sheep was lost. The shepherd did not wait for the sheep to find its way home, but went out to secure it. God pursues those He has called. He doesn’t wait for us to find Him, but He finds us. God initiates the personal relationship we have with Him. He calls to us through the Holy Spirit, drawing us closer and closer to Him. Neither Terri or I were looking for God when He called us. We had dated eight years before we ever had a conversation about God. It wasn’t until we took a horseback ride up a mountain near Taos, New Mexico that we both felt the presence of God in our lives. This is not to say that God hadn’t spoken to us before. He had. But this time was different. This time, we listened and answered His call. God cares for those He saves. The mental picture of the shepherd carrying the sheep home on his shoulders resembles Jesus loving care of those He saves. It is a picture that would have been familiar to the shepherds living in that rural area. It was something they themselves had done numerous times. In the same way shepherds care for the sheep in the flock, God cares for each of us whom He saves. You’ve heard the saying “If it weren’t for bad luck, I’d have no luck at all.” Being separated from God seems like an exercise in futility. With God, we find our purpose. With God, we gain peace and understanding. With God, we know real love. Does that mean we won’t face trials or tribulations? No. Not at all. But we don’t go it alone. As believers, we go with God. He is with us wherever we go. The Lord Delights in the Saved. The ninety-nine righteous people are the self-righteous Pharisees and lawyers, challenging Jesus and His authority. Jesus was using the term “righteous” ironically. These so-called religious leaders were only righteous in their own eyes, not in the eyes of the Lord. The Lord delights with joy over one sinner’s salvation and He grieves over the 99 lacking salvation. Only those who profess Jesus as Lord and Savior will be saved and enter into Heaven—or the presence of God. Before God, our lives were completely different. Our “why” changed once God became part of our daily lives. That’s how we knew we had changed direction and were now on the right road, walking with God, no longer straying off the path. I am glad that God rejoices over the saved. I am filled with joy knowing that He delights in me. I hope you can say the same. May the Lord bless you and shine His favor on you.